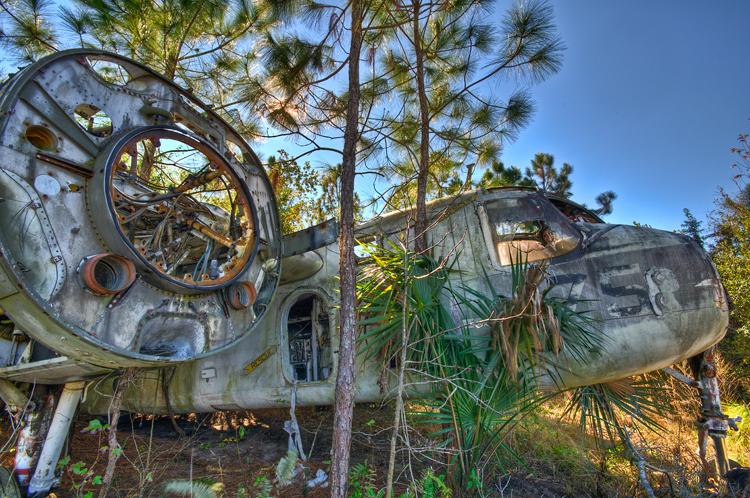 *Please note, the Airplane Graveyard was destroyed in May of 2011. 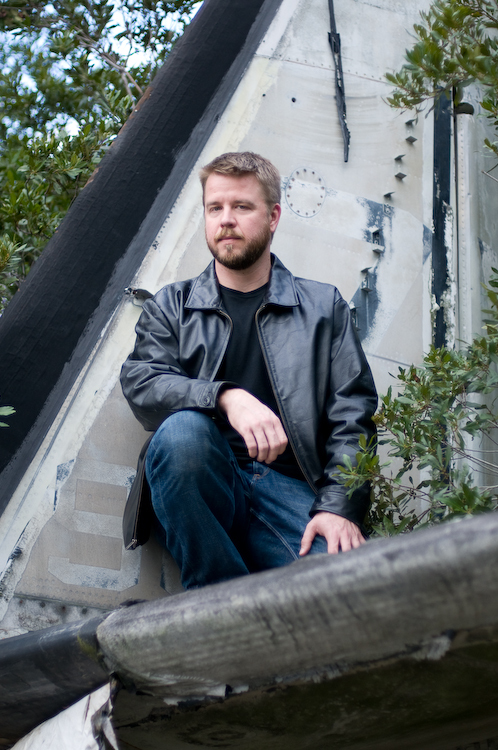 I was in Gainesville, Florida this January to visit one of my best friends, Casey to see his performance in the play Closer. While there, we made plans for a trip to St. Augustine (his hometown) to do some head shots for him and to seek out interesting locations. 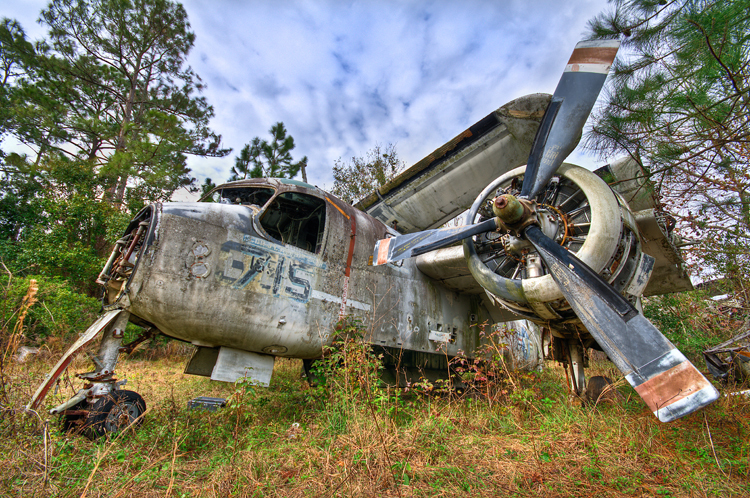 I had seen a picture on Flickr of an old abandoned airplane near St. Augustine. We did some research and found Agnes Lopez. She specializes in wedding photography, but she had done a photo shoot at the location we sought. I emailed her asking directions. Not 30 minutes after I clicked send, she called me and was more than happy to point the way, but not before warning us that it was on private property and we should be careful. (She was very friendly and her photos are brilliant!http://news.agneslopez.com/) We later learned that the planes are Grumman S2 Trackers, naval bombers from 60’s and 70’s. They were one of the first aircraft designed to combine the detection equipment and armament to hunt and destroy submarines while operating from aircraft carriers. These particular planes (the S-2C’s) were outfitted to preform photo reconnaissance work as well. 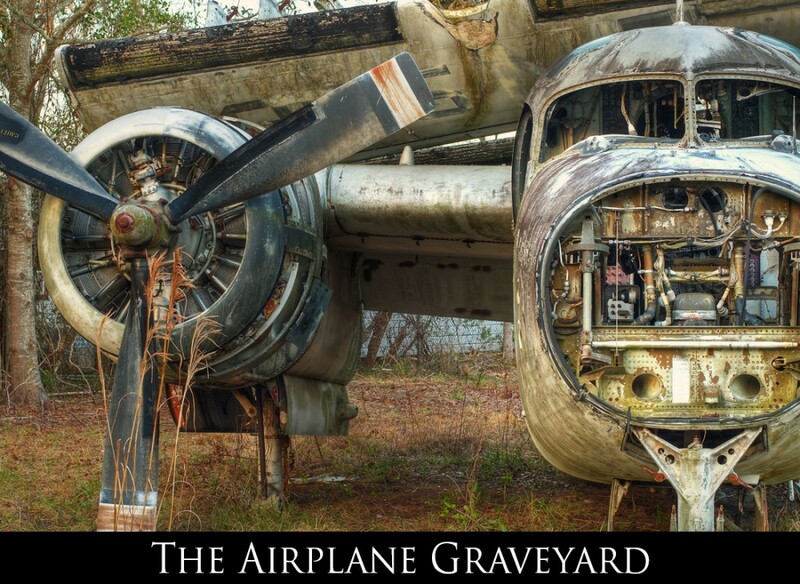 The planes and property are owned by a local man who had bought them and stripped the parts to sell to the local Grumman company. 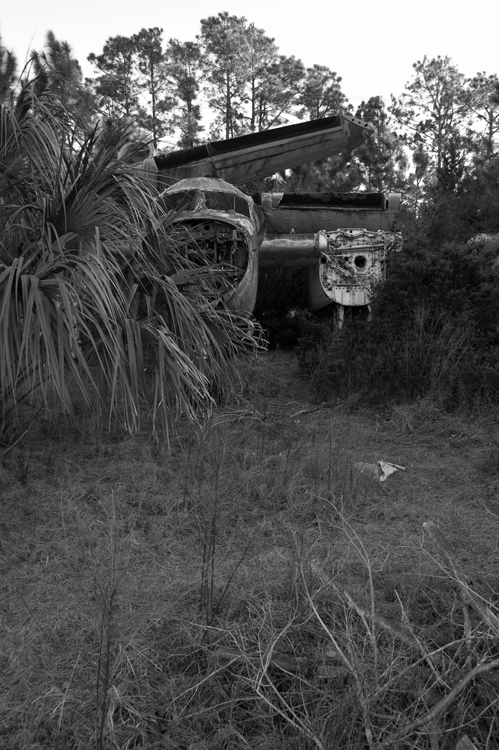 The next day Casey and I set out on a mission to get him some rockin’ head shots and to find this airplane. We pulled up in the parking lot of the pier on St Augustine Beach and the familiar cool crisp smell of the ocean filled my nostrils. Casey had 4 pictures of himself that were taken about 10 years ago at the same location and one goal for the day was to recreate those shots. An hour and a couple hundred shots later we started packing up, but not before meeting and talking to Casey’s sister and mother who joined in a few of the shots. After lunch at the Gypsy Cab Café it was time for the airplane. Casey called a friend who said he knew exactly where the planes were. PLANES? There was more than one??? Yes, according to Greg, there were at least eight! With my energy and excitement now ramped up, imagining what this place might look like, we picked up Greg in a CVS parking lot and headed off. 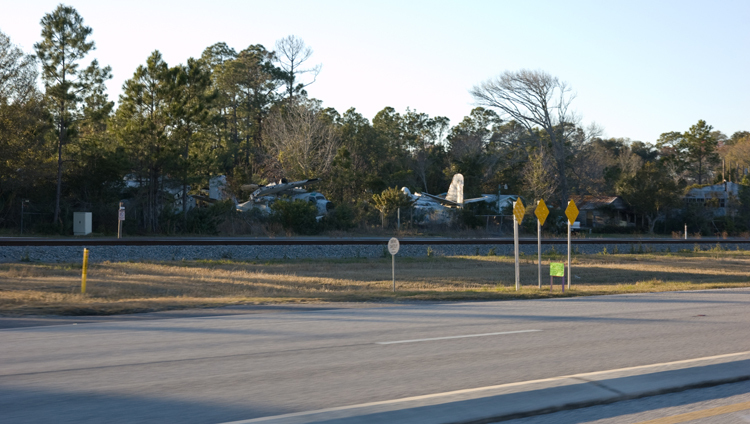 Not five minutes down the road we saw the giant tail fins of an entire graveyard of old war planes looming across the highway from us, and sure enough there were many of them in plane sight (sorry had to do it…). We U-turned and made a slow trip past the fenced property. I noted that there was not a single ‘NO TRESSPASSING’ or ‘PRIVATE PROPERTY’ sign anywhere. 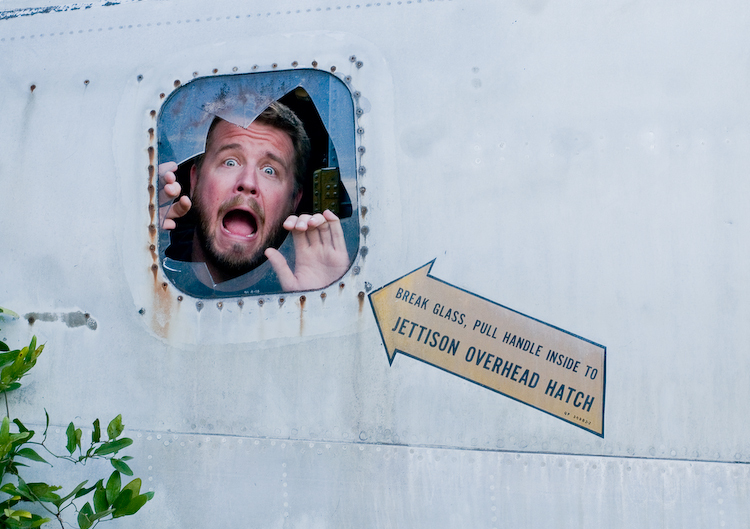 Greg spotted a large opening in the chain-link that provided easy access to the planes. Equipment ready we parked and slipped quietly into the overgrown lot. 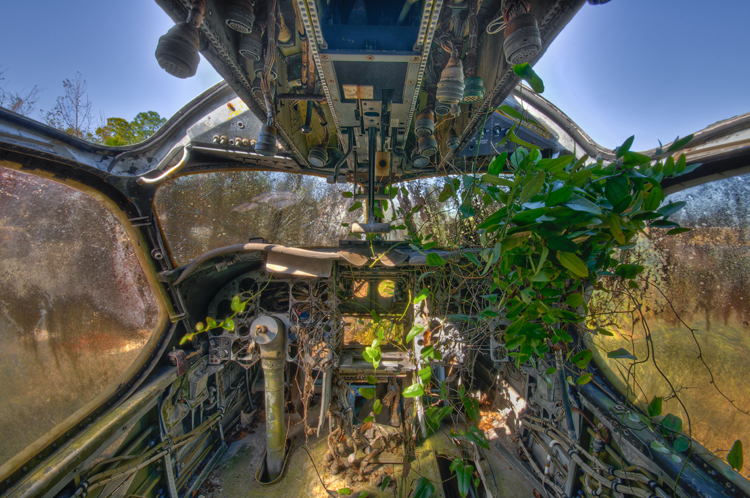 As we stepped through the brush we walked on and around old pieces of the planes, tires, wings, control boxes, and the occasional beer can. At the first plane I came to I saw that, being aircraft carrier planes, the wings were folded over the top. 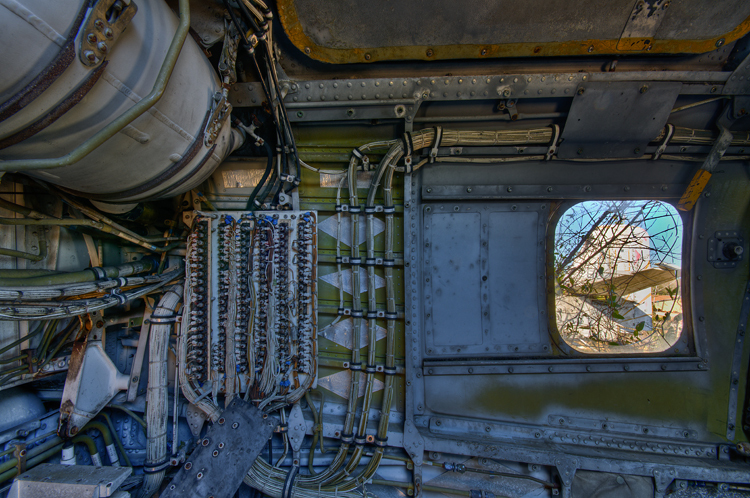 The engines and propellers had been removed from this particular plane and the nose was missing, but the fuselage was intact. As we walked under the wing, we came to a small access hatch that was barely big enough for a hobbit to step through without ducking. 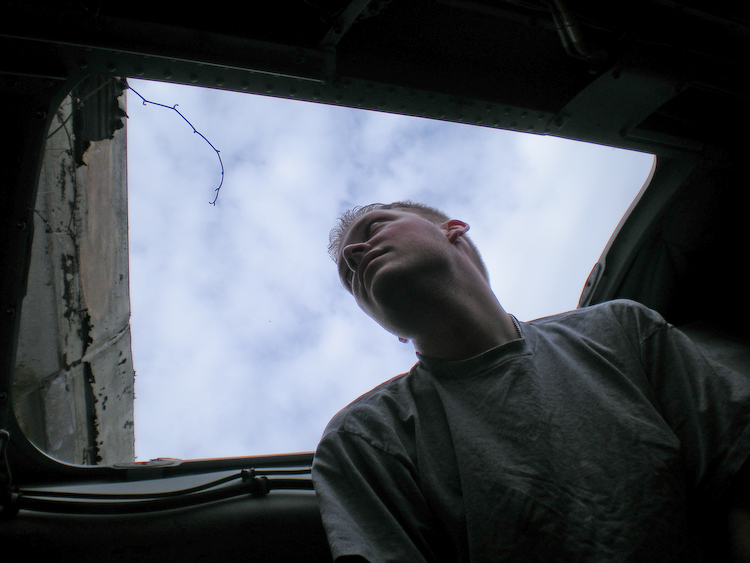 I stuck my head inside the plane and looked around. 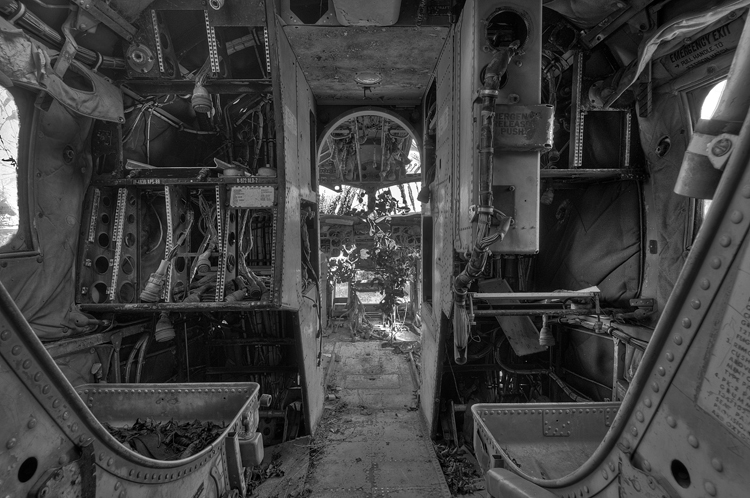 The interior of the midsection of the plane had been stripped of all equipment leaving bundles of wire hanging from empty compartments like jungle vines. 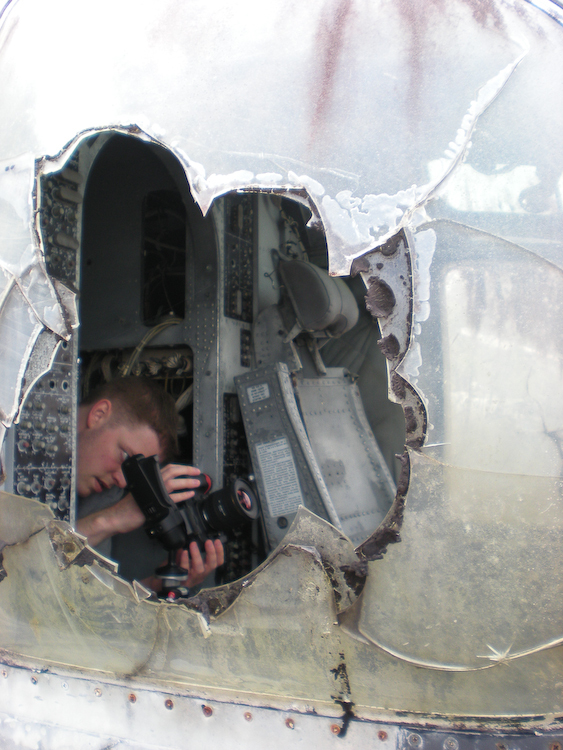 My mind raced with possibilities for the countless amazing shots inside these planes. This was my heaven, these are the photo ops that I live for! 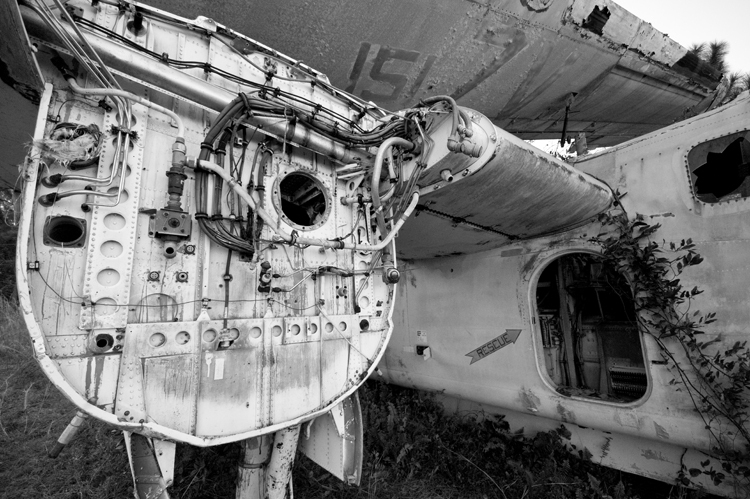 The beautiful contrast of industrial, man made decay juxtaposed against the slow progression of nature taking over again is a subject I love to explore.The plane looked stable enough, so I turned to Casey and Greg. “I’m going in! I just want you guys to know that if this plane collapses and I die, that I will have died happy!”I hoisted myself up into the fuselage of the plane through the hobbit door and crouched there a second, making sure everything was stable. Thankfully, it felt solid as a rock. From the low ceiling, to the wire bundles that hung like ropes, to the protruding rusted metal parts, everything screamed tetanus! Casey carefully passed my tripod mounted camera up through the hatchway to me. 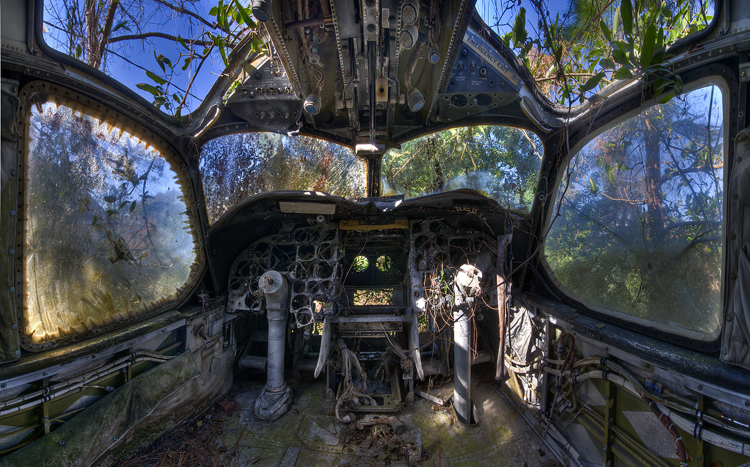 Hunkered over, I slowly made my way up to the cockpit. What I saw was sheer beauty. 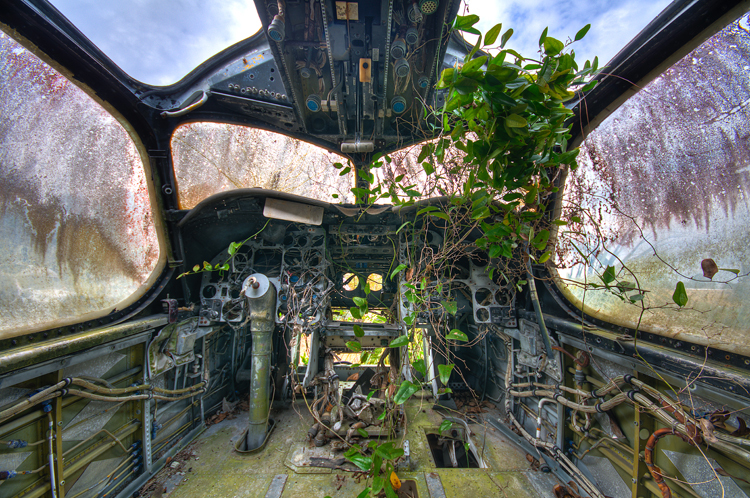 Over the years, vines had wound their way up through the windows and skeletal nose of the plane and draped the inside of the deteriorated cockpit. 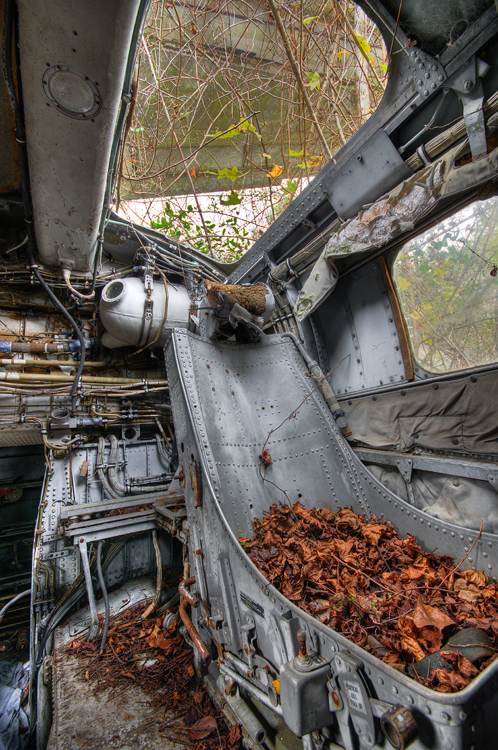 The seats had long ago been stripped of their padding and were now bare metal repositories for dead leaves and debris. 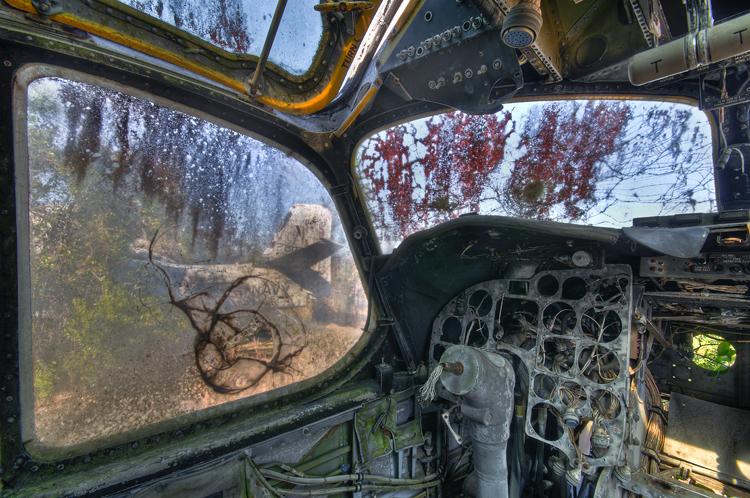 I proceeded through the airplane graveyard with Casey and Greg who helped point out interesting shots and helped me in and out of the planes as I explored each one, getting shots of every cockpit and interior. We occasionally heard voices from the nearby houses so we kept as quiet as possible. Greg had seen a cop car drive slowly by a few times but they never stopped. 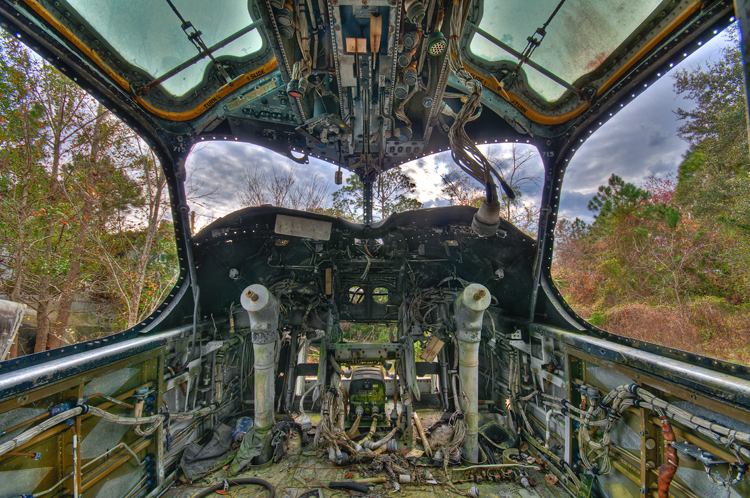 After I had my fill of HDR shots, Casey suggested that we do some shots of him inside a plane. 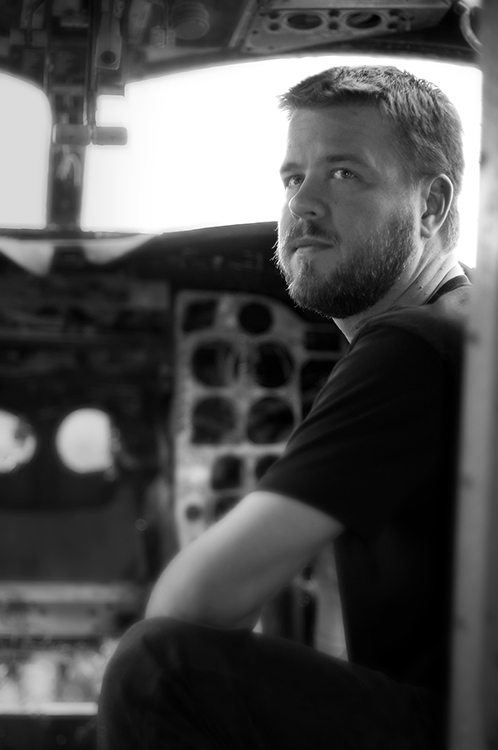 The bombed out cockpit made an awesome backdrop for some unique portraits. We even relaxed enough to have a little fun with some of the shots as well. Before we headed out Greg assisted the brave and foolish Casey up onto the tail fin of one of the planes and we did a few shots up there as well. Back in the car, I was exhausted but still on a natural high from exploring the planes. I couldn’t stop talking about how amazing the experience was and I couldn’t wait to see my shots. For good measure my dad and I returned to the graveyard two days later, just to be sure I had thoroughly explored all the possibilities. All in all this ranks in my top five favorite photo shoots. 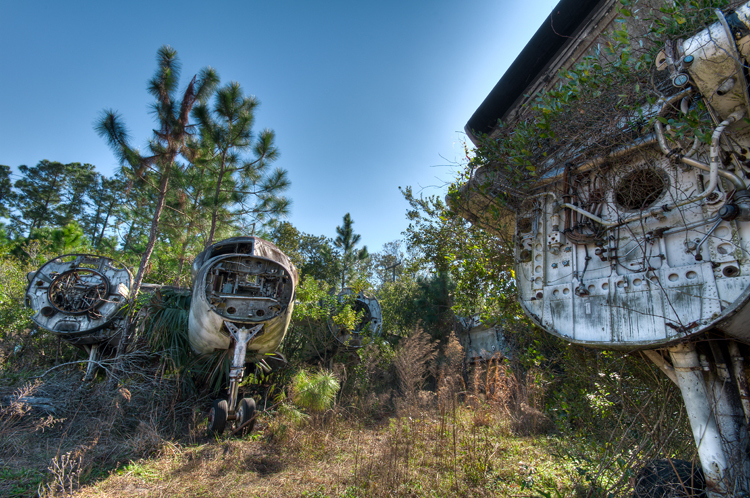 The locals say the planes have been there for at least 15 years, so when I return they should still be there, resting with the other retirees under Florida’s tropical sun. Brings back a lot of memories. 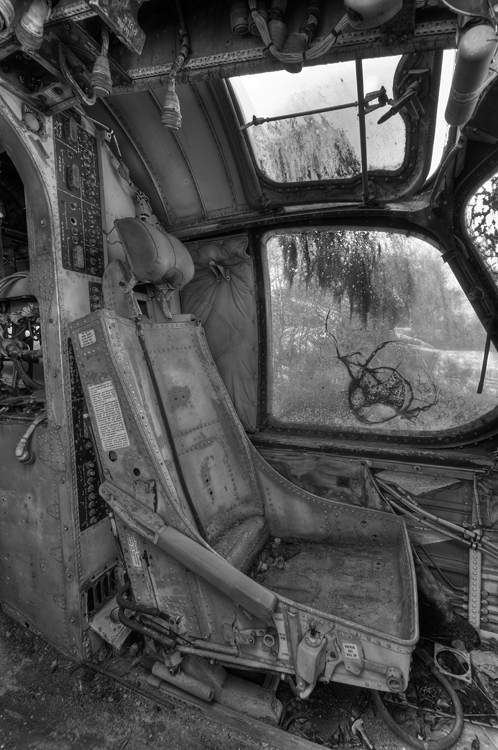 I was a plane captain in VS-31 in 1966-67. We were in Quonset Pt. RI and deployed on the USS Wasp CVS 18. Love the sound of those big radials. They are gone now, scrapped by the owner. So sad, I actually flew in one off the USS Kitty Hawk back in 1975 when I was attached to VS37, the last Stoof squadron. It’s the one with the “sunburst” on the vertical stabilzer. I would have loved to see these birds in action! Thank you for your service! could build one up and offer it to a/an museum. Thanks Bob. how can i contact this graveyard? Matthew I would love to see the shots you got here! Do you have an online gallery where they are posted? I just wanted to say thank you for your post! I live in Ponte Vedra Beach, just north of St. Augustine and I was looking for just the place to take some 50's style pin up pictures for a photo shoot! 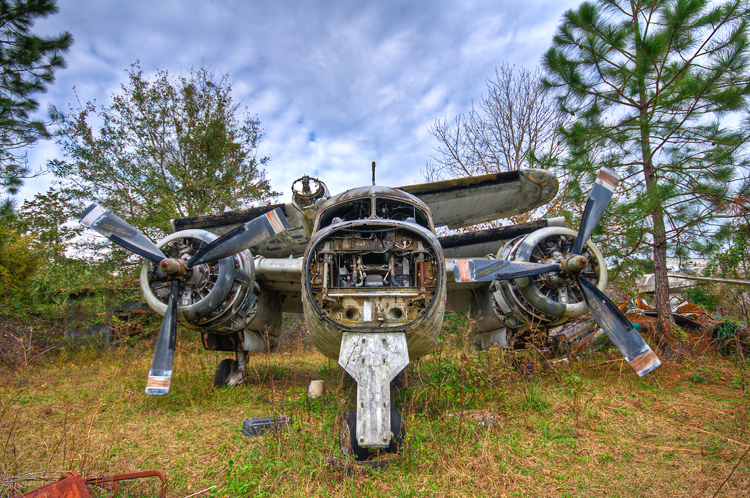 Since you have been there they have cleaned up around the airplanes a lot, there are some no trespassing signs around however that did not seem to stop me as well as 2 other groups of people that stopped by to walk around and take pics while I was there doing my photo shoot. Even the neighbors were out and about and a cop passed by right when me, my assistant and the model were stepping through the huge gap in the chained gate and he just kept on driving.. lol. The HDR pictures that you took came out awesome! I am going to be experimenting with that soon. The photo shoot turned out awesome and my model absolutely loved the pictures! I wish I could post a couple on here for you to see. Great Photos. I served as an aircrewman aboard these type aircraft and your photos brought back many a memory of North Atlantic Antisubmarine warfare missions and the great people that I served and flew with. These type aircraft were among the safest aircraft that were ever operated by the NAVY and as Gordy Bonnell said…alot of them are still flying. BTW Hi Gordy! I only flew with you a couple of times but I'll always remember the time we literally fell out of the sky to check out a strange wake only to find a whale. What fun! 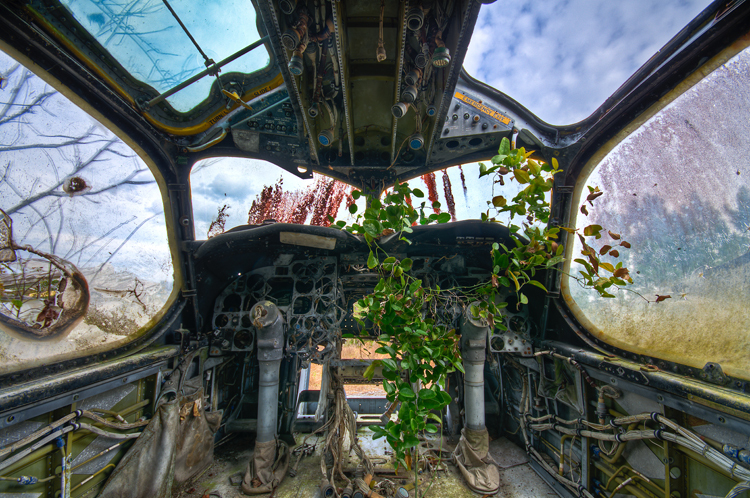 To me, it's very sad to see those S-2's(Stoofs)so stripped and overtaken by weeds. I logged many hours, day and night, flying them from many of our WWII Aircraft Carriers: Valley Forge, Lake Champlain, Essex, Randolph, Intrepid, Antietum. The sight brought back many, many memories of searching for Russian subs during the Cold War era. ASW flying was 'hours & hours of boredom, interspersed with brief moments of stark terror!' There's an 'alumni' group called RAFS (Real Aviators Flew Stoofs!). Thank you for your wonderful photographs. They resonated with me on three levels. 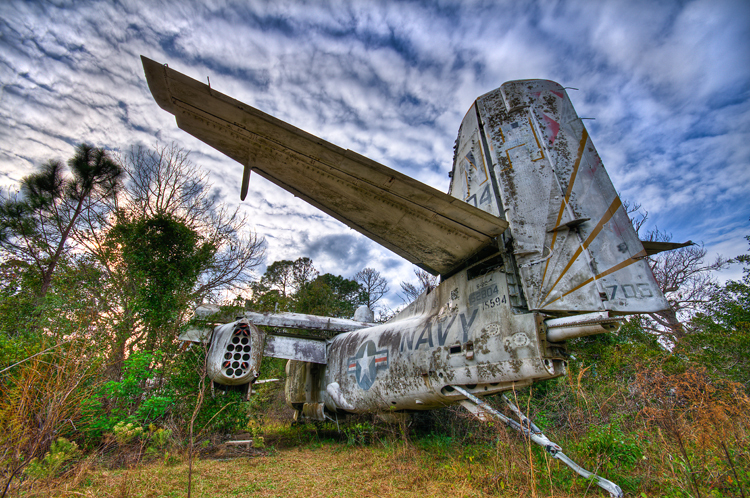 First: I am a retired Naval Aviator who flew the Grumman S2 (the type of aircraft in your photographs). I have many memorable flight hours and carrier landings in my log book. The ghostly, silent hulks that confronted you were once alive to me. 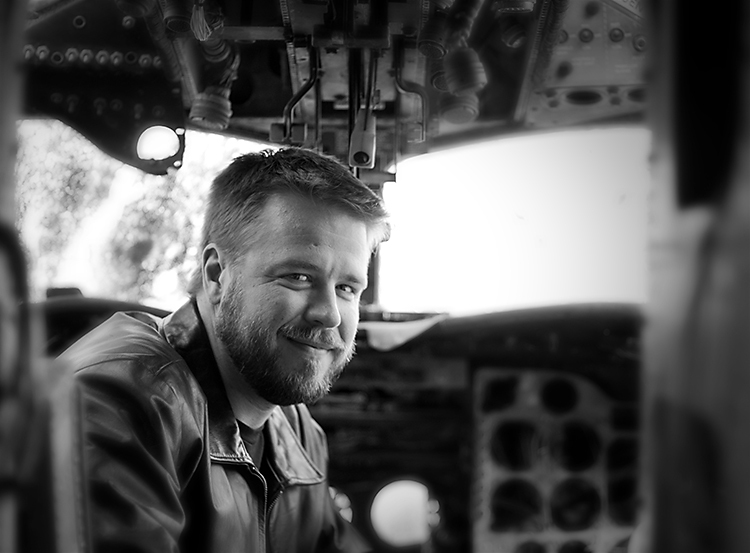 I have a vivid recollection of memories: intercom conversations among the crew, long hours in the air, consumption of inflight lunches, adrenalin-pumping night landings on the carrier following 6 to 7-hour flights, post-flight debriefings in the ready room, plane captains exhibiting their pride in keeping their birds more pristine than the next guy… these machines were alive and had individual personalities, not the stoic headstones you witnessed. The "hobbit" hatch you saw was not the restrictive hole confronting you, but the entrance into a new experience and opportunity for achievement each time a pilot manned his plane. Second: My undergraduate degree was in Fine Arts with a major in photography. So I can appreciate your wonderful eye and the superb craftsmanship of your camera technique. 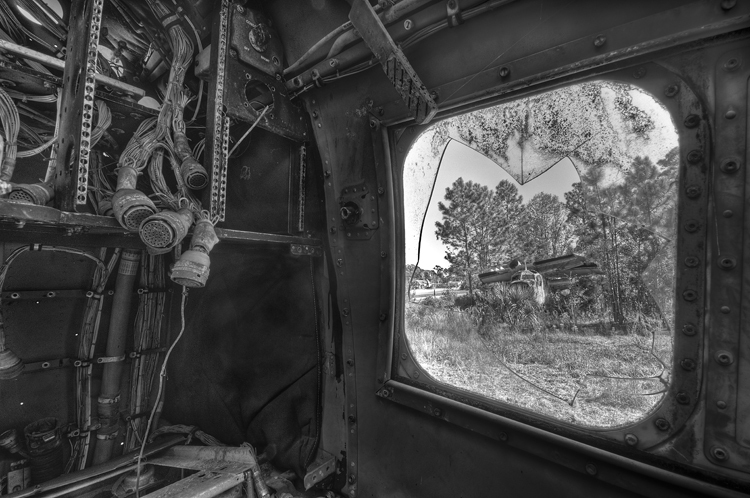 Since the S2 was quite gray, your black & white images were particularly enjoyable. Three: Now, as a manager of a southern pine plantation near where you photographed the S2s, I have become particularly familiar with the primary, invasive vine shown in most of your photographs. It is Smilax, a genus of the lily family Liliaceae. It is ruthless in its aggressive coverage and someday will most likely create a cocoon for the unfortunate S2 airframes. Your comment about plane captains exhibiting their pride in keeping the birds pristine was the first time I’ve ever seen such a comment from a Navy pilot in print. I was a plane captain starting out at NAAS Miramar in 1952 with an SNB and an SNJ to care for and then in Project Cutlass with an F7U-3 Cutlass to maintain. Project Cutlass was absorbed by VF124 where the F7 was proven to be an a/c that wasn’t safe to fly but proved to be a great test platform for future fighters. My Cutlass was 401 flown by Mr. Schirra. He gave me the compliment that I made the Cutlass less Gutless when we met after years of being out of the Navy and that made my years of being in Naval Air well worth the time spent. 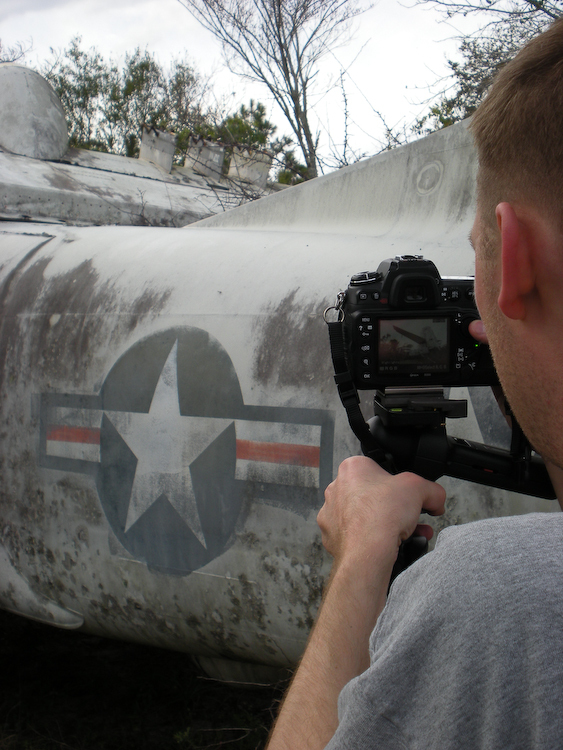 Thanks for your appreciation of our contributions to keep them flying safely. My dad used to take us to see these planes all the time – we have tons of pictures of them. I haven't seen them recently, have they been scrapped? There is a Grumman factory/airbase basically across the street, which explains the planes' origin. These are wonderful pictures, thankyou for taking them. Most of these HDRs were 7-12 shots. The dynamic range from the dark insides to the bright outsides required quite a few shots! 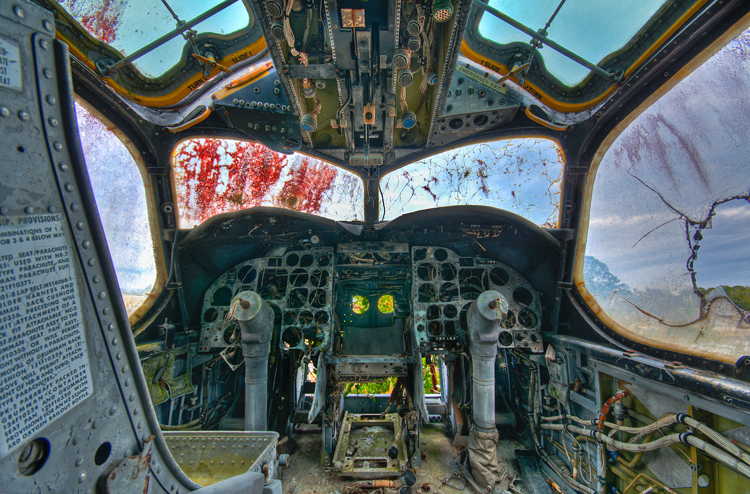 Awesome use of HDR on those planes – well done! How many shots were you using on those ??? I’m jealous :). I actually live not half a mile away from these planes and look at them longingly everytime I pass. I’m too much of a wimp to go into the property to take pictures, mostly because there is a house so close by. I’ve thought of going to the house to see if it’s theirs and ask permission, but i’m too shy for that!